A group of men were caught on camera using big nets to fish along canal Sungei Ulu Pandan canal which runs through Ghim Moh. Stomper Bertrand witnessed the incident on Dec 29 at about 5.10pm and took a video, which he sent to Stomp. In the video, a group of six men can be seen using two large green nets to fish. The Stomper said: "The men were using very big nets. "Along the railings near the canal, there are signs put up which show that fishing is not allowed in the area. 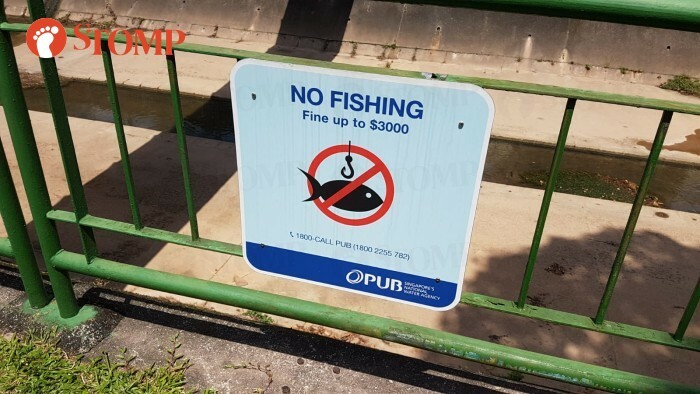 "In fact, there is a fine up to $3,000 if caught fishing. "This is not the first time I have seen men fishing here. "The last time I saw men, they were in red shirts too and had caught a net full of fish." Bertrand is a resident of Ghim Moh and walks by the canal every day. He told Stomp that he doesn't see as many fish as he used to. "When I walked by last time, I was always excited to see many fish and turtles. "There used to be catfish and a family of turtles too. "However, in recent times I have not seen any of them. "I hope to create more awareness and remind people that the preservation of wildlife is important."